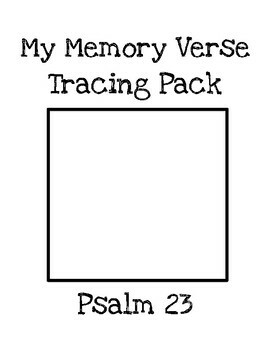 I created a Psalm 23 Bible Verse Tracer for the boys to work on together. The first day we listened to our Sing the Word track while the boys traced their Bible verse. Tuesday they illustrated their Bible verse, Wednesday we cut it apart and glued it into his Bible lapbook, and Thursday he recited it by memory. This year, I decided to do the Kid’s of Integrity Christmas lesson plan leading up to Christmas. I created our Advent wreath this week and we’ll slowly work our way through the Bible lessons, but we’re going to take our time since we have another week of our regular Sonlight Bible lessons. We continued lapbooking around the world with Kate and Mack. This week we learned about Japan. We created a page for Japan in our lapbooks and wrote “Japanese Sign Language” as the heart language for this week. The boys colored the Japanese flag and added sketches of sushi and kimonos to their lapbooks. We incorporated a little Christmas around the world as we read Tree of Cranes, a Japanese child celebrating his first Christmas. At the end of the week, Daddy surprised the kids by ordering Japanese food! The kids used their chopsticks and thoroughly enjoyed their meal. We love how Sonlight incorporates a complete world perspective in their curriculum. It’s fun to sample some of the flavors we learn about. Such a fun way to wrap up this week! I created a Roll, Read, and Cover worksheet to accompany lesson #16. Parker rolled his way through this week’s word list. 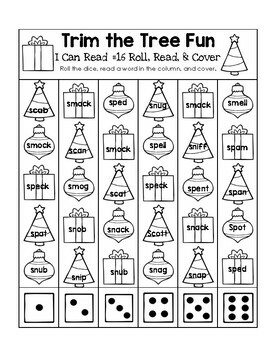 Once he arrives at the winner, I have him continue to color and say each word until he’s read them all! 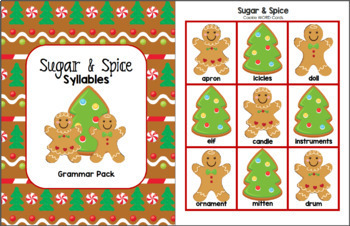 I created a Sugar & Spice Syllable pack for Parker to work on this week. You can purchase it here at our TPT Store. There’s a bonus FREEbie in the Preview. First, Parker sorted the stack of picture cards by the number of syllables. Next, he color coded the cookie worksheet. Last, he sorted through the pictures and cut and pasted them by the number of syllables. We continued our math work on measurement. We brought out our Christmas manipulative tray to make things for festive. We measured various objects around the room to see how they compare. We used non-standard units like Jingle Bells. Parker was able to see how many jingle bells our reindeer weighed. Parker has really enjoyed this unit on measurement. I gave some free time to weigh various objects using buttons, bells, and the-like. He recorded them in his math lapbook. We headed to the kitchen to do a few water science experiments. First, I filled a jar with water to the brim. Next, I used a penny to press the very tip against the water and you can see the bend as it touches the water’s “skin” just like we read about. We took turns sliding pennies into the jar and saw the skin stretch (this picture has a great view of the rounded “skin” at the mouth of the jar). We talked about how water drops are always the same shape. We added two rows of drops, but it’s really hard to see on the yellow tray. I challenged the boys to flatten the droplets. They couldn’t flatten the droplets until we put a little dishwashing soap on the straw. The soap weakened the water’s skin which allowed them to flatten the droplets. Last, we followed the directions in the book and made a bubble solution. Everyone took turns blowing AND popping them. Jordan was learning about Christmas in Germany as we studied A New Coat for Anna. We learned about the Christmas Markets and prune dolls. I cut floral wire in three pieces. I hot-glued a walnut to one piece, wrapped the other around and hot-glued it in place as the arms, and bent the legs and made a hook at the trunk of the body. They used paint pens to draw little faces on their prune people. They added three dried figs for the body and prunes for the arms and legs. They were funny little guys! Traditionally, their dressed in hats and clothes, but we left them in the raw since we planned on eating them before Christmas!